BMW's upcoming all-electric iX3 has been spotted with minimal disguise on German roads ahead of its launch next year. The new images are the most revealing prototype shots of the Jaguar I-Pace and Audi E-tron rival since the company previewed the iX3 concept (details and pictures below) at the Beijing motor show in April 2018. The latest shots reveal a car that appears close to production and the minimal camouflage wrap highlights a number of previously unconfirmed details about the model's design. The lack of any visible exhaust pipe and presence of an 'Electric Test Vehicle' warning sticker are obvious giveaways of the car's identity. BMW's trademark kidney grille is also blanked off, as with the concept, but elsewhere the iX3 retains a strong resemblance to its petrol- and diesel-powered counterpart. The car appears to sit comfortably alongside other models in BMW's stable. 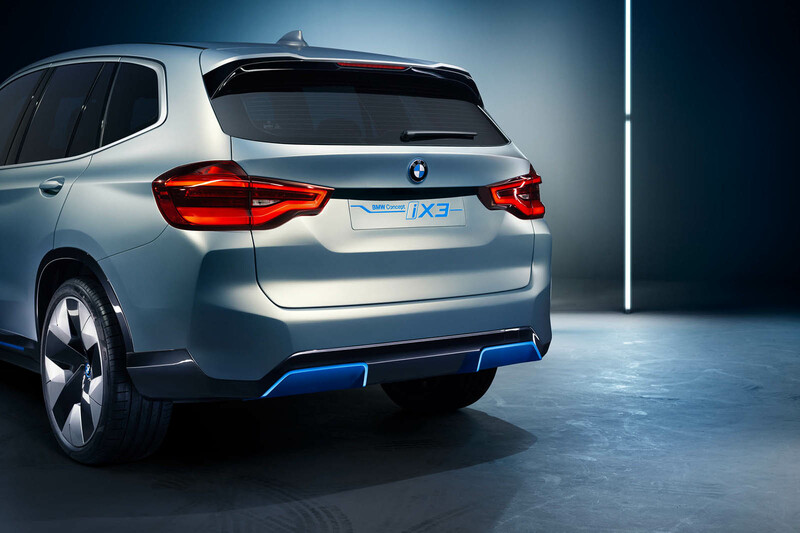 Any necessary modifications to the standard X3 appear to have been subtly concealed, whereas the radical designs of the earlier i3 and i8 were heavily influenced by the new technology they exhibited. The car's zero-emission powertrain will be at the heart of 11 upcoming electric vehicles from the German car maker. BMW is allowing potential buyers of the iX3 to register their interest online, ahead of the model's planned 2019 release date. BMW says lessons learnt through the establishment of its i sub-brand and recent developments surrounding its upcoming iNext model have allowed it to provide the new Concept iX3 with a “new dimension” in performance, operating range, weight and packaging over its first dedicated electric-powered production model, the three-year-old i3. The new pure-electric SUV, unveiled at the 2018 Beijing motor show, closely previews a new X3-based model being developed as a rival to the likes of the Jaguar I-Pace, Audi E-tron quattro and Mercedes-Benz EQ C.
The production version of the iX3 is planned to be the third pure-electric model from the BMW Group, following on from the recently facelifted i3 and an upcoming production version of the earlier Mini E due out in 2019. It is planned to go on sale in the UK in 2020, preceding the launch of a production version of the Vision Efficient Dynamics saloon revealed at last year’s Frankfurt motor show featuring a similar powertrain that, BMW chairman Harald Krüger says, is due out in 2021. The styling of the Concept iX3 leans heavily on the standard X3. Among the unique design elements serving to differentiate it from existing petrol and diesel versions of the third-generation SUV are reprofiled bumpers, a newly styled grille, aerodynamically optimised wheels shod with low-rolling-resistance tyres, subtle additions to the sills and a new rear diffuser element. At the heart of the Concept iX3 is a newly developed electric powertrain. 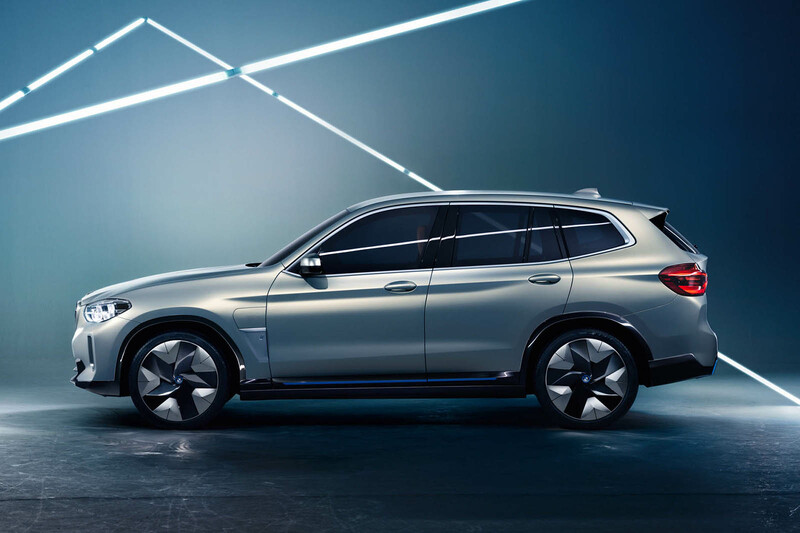 Mirroring the unit set to be adopted by the production version of the new SUV due out next year, it combines the BMW’s fifth-generation electric motor with what has been described to Autocar as fourth-generation battery cells supplied by Korean battery specialist Samsung. The new electric motor develops more than 270bhp and the battery is claimed to possess an overall capacity of over 70kWh. Together, they are claimed to provide the new SUV with an overall range of more than 249 miles on the latest WLTP cycles. Although BMW has not yet confirmed details about the drive method chosen for its latest electric-powered model, the X in the Concept iX3’s name suggests the production version will receive permanent four-wheel drive. As with the upcoming Audi E-tron quattro, the new iX3 features a control unit that permits its battery to be charged at so-called fast-charging stations generating up to 150kW. This, says BMW, allows it to be fully charged in just 30 minutes. 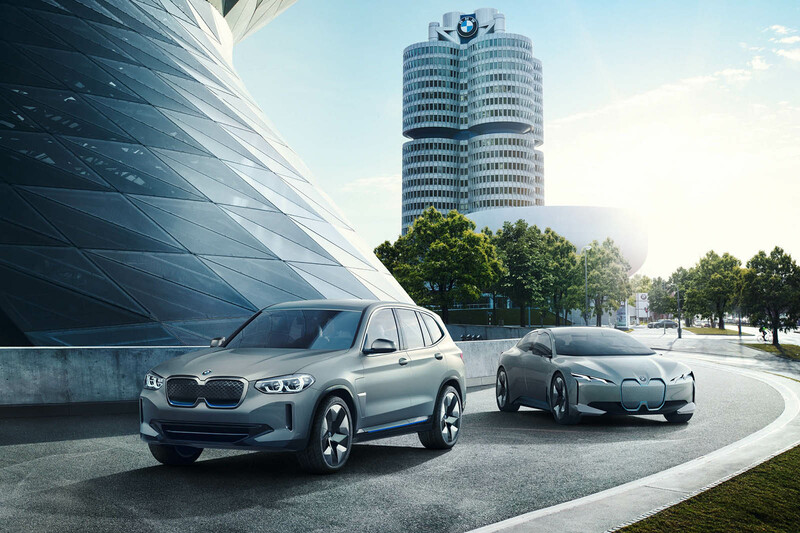 Further details made official by BMW at the launch of the iX3 reveal its powertrain is distinguished by a more compact design than that used by the existing i3, with the electric motor, transmission and power electrics grouped together in a single component. In a breakthrough that will allow it to significantly reduce production costs over the unit in use today, BMW also says its new electric motor can be produced without any rare earth materials. ...it comes to something when the mighty BMW starts apeing Kia. I suspect the redesigned grille has more to do with locating the sensors for driver assistance systems than any real attempt to distinguish this from the standard X3. Other manufacturers have been moving their radar sensors from the lower grille, below the bumper beam (where they are on the current X3), to a higher position behind their badge (Mercedes-Benz, Hyundai, Volkswagen,...). The traditional BMW grille doesn't offer the same opportunity, so something had to be done - either separate the two parts further, or merge them. x3 is bigger than i-pace, Jaguar didn't want to join already crowded, low margin c-segment hatches as other premium manufacturers in my opinion . So they came up with something different with same size/dimentions. X3 is a full blown SUV. What an adventurous piece of design, not.. At least Jaguar made the effort to make iPace look a bit different in its proportions from conventional models. I wish manufacturers would start giving us some different designs that EV packaging allows. Just when you thought BMW's styling couldn't lack any more imagination, they're now not only resorting to using an existing, but terminally dull looking, SUV from their range, but they've decided to used a modified version of Kia's grille. BMW's styling, like that of AUdi, Mercedes, VW and Porsche, really is stuck in a rut and churns out dull and uninpiring looking cars year after year after year. With their stunning i-Pace, Jaguar has nothing to worry about from this half-hearted and undesirable iX3. Still, at least BMW gives Jaguar's designers and engineers something to laugh about yet again! Does it have such a long bonnet? It looks no different in length than a straight 6 carrying X3. They say they used an i3 for design cues and that hardly has a bonnet. Jaguar got it right, sooner to! Jaguar havent got anythign right for over 10 years. Looks like they did get it right afterall. And by 2020 when this electric X3 is on the road Jaguar still won't be able to make enough to kepp up with demand. Only has a target range of 249miles WLTP which means that at 75mph on the motorway with heating or Aircon on it will probably get you about 200 miles maybe slightly less. It definitely looks to be in a different segment from the ipace but I bet internal space is similar. So far all EVs have looked pretty much like a conventional car. I'm hoping that someone soon brings one to production that looks more like a spaceship or a submarine.